Dak Prescott addresses the media in Oxnard, Calif.
Dak Prescott took an unprecedented, firm stance on protests during the national anthem. 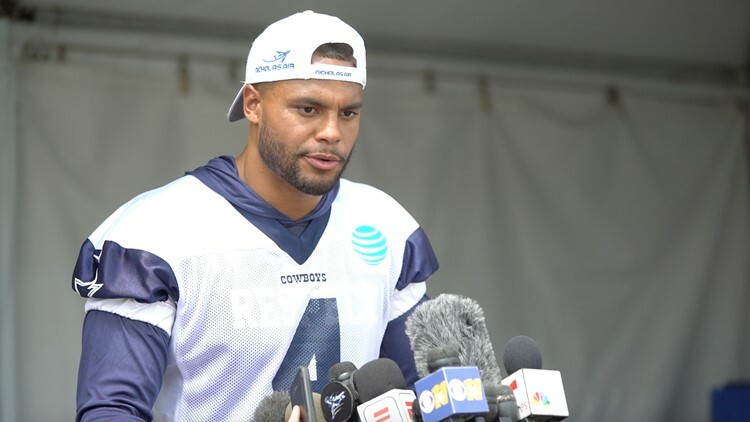 OXNARD, Calif. – Cowboys quarterback Dak Prescott isn’t bothered by owner Jerry Jones’ firm stance on the national anthem because he doesn’t think the anthem is “the time or the venue” for protest. The third-year quarterback’s words, issued Friday after the team’s morning walkthrough in Oxnard, were his strongest yet on the issue that has shrouded the NFL in controversy for the last two years. Jerry Jones on Wednesday said he wouldn’t support a player who elected to stay in the locker room during the anthem – an option given in the NFL’s now-halted policy proposed earlier this offseason. “Our policy is you stand for the anthem, toe on the line,” he said. The next day, Cowboys executive vice president Stephen Jones said players will stand for the anthem “if they want to be on the team," according to the Star-Telegram. Prescott said he believes the practice of kneeling during the national anthem, which began with Colin Kaepernick in 2016, has accomplished its mission of bringing awareness to social injustice in the United States. When asked if there was any specific action he had begun to take, Prescott didn't describe any specific endeavor but said he's "up for anything." "For me it’s just about continuing to inspire and motivate and hopefully people can hear what I say and believe in that," he said. "I’m up to get involved in any way that we can with fixing the social injustice and police brutality and all the things that are going on in our country. I’m all for making a difference and you can count me in if you can find something worth the action to do so that would help fix it." Prescott said he believes in standing up for a cause, and respects players that still choose to kneel or perform some other form of silent protest during the national anthem. “[If] they believe it’s gonna make a change, and it’s making a difference, then power to them,” he said. One of those players is Malcolm Jenkins, a member of the Cowboys’ NFC East rival the Philadelphia Eagles. Jenkins on Friday morning was quoted calling Jerry Jones a “bully” for his policy on players’ action during the anthem. Mr. Trump has long been a critic of using the anthem as a time for silent protest. Cowboys head coach Jason Garrett, who took the podium just minutes after Prescott spoke Friday, declined further comment on the topic.